Today is a recipe on how to make "Pumpkin Cupcakes with Sunflower Nut Filling"
The sunflower nuts in these filled pumpkin cupcakes resemble tiny pumpkin seeds. Their salty flavor provides a nice flavor contrast to the sweet frosting. In large bowl, beat cake mix, pumpkin pie spice, pumpkin, water, oil and eggs with electric mixer on low speed 30 seconds, scraping bowl constantly. Beat on high speed 2 minutes, scraping bowl occasionally. Divide batter evenly among muffin cups, filling each 1/2 full. Bake 15 to 20 minutes or until toothpick inserted in center of cupcake comes out clean. Remove from pan; place on cooling rack. Cool completely, about 30 minutes. In large bowl, mix fluffy white frosting and sunflower nuts. With melon baller, scoop out center of each cupcake, scooping almost to bottom of cupcake. Spoon about 1 tablespoon frosting mixture into center of each cupcake. In medium bowl, mix creamy white frosting and orange gel food color until well blended. Spread over tops of filled cupcakes. 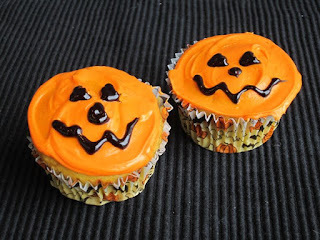 Use black decorating gel to make a jack-o-lantern face on top of each cupcake. For easy storing and transporting, use a cupcake caddy. For Thanksgiving, omit the orange frosting and jack-o-lantern decoration. Make the cupcakes as directed in the recipe, but frost them with Betty Crocker® Rich & Creamy cream cheese frosting.